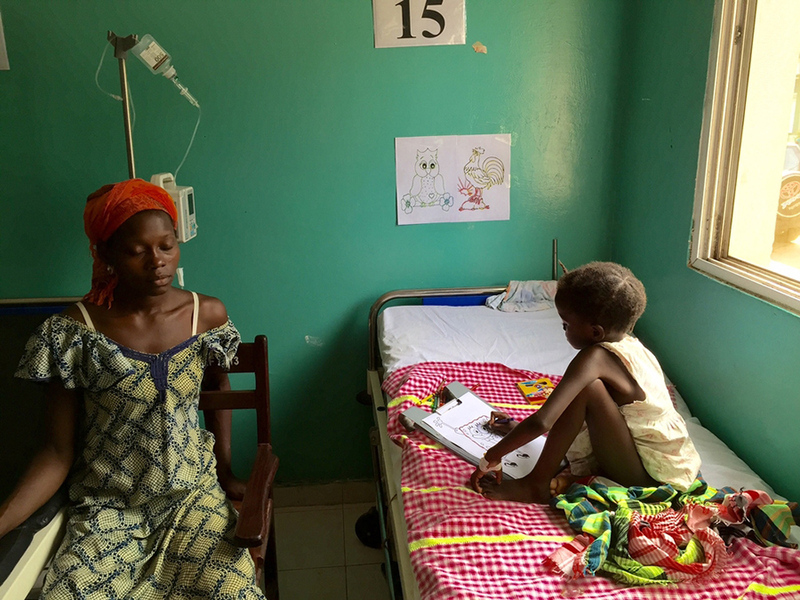 I am going to tell you a little about Fatumata, a three-year-old girl who was hospitalised. She was severely undernourished and mostly skin and bones. But that was not the reason her grandmother and mother brought her to hospital. They brought her because of the fever and respiratory distress that the traditional medicine they tried first didn’t take away. She was admitted to our malnutrition department and received treatment for pneumonia, but the fever continued. We found enlarged lymph nodes in her throat and around her jaw and began to think it could be something more than just common pneumonia. In Guinea-Bissau there can be a lack of food during the dry season if the harvest has not been good, but more often there is an underlying disease behind the malnutrition here. Most commonly, HIV or tuberculosis. We can test for HIV, which we do routinely for all malnourished children, and Fatumata’s tests were negative. The best way to test for tuberculosis is looking at a sample of mucus under the microscope. The problem is that young children are not so good at coughing voluntarily and rarely bring up mucus from the lungs. Instead we use the ‘exclusion method’: we treat the infection as if it was pneumonia for two weeks with two different antibiotics. If the child doesn’t improve we start treatment for tuberculosis. Fatumata also had a relative at home who had been coughing for a long time, which increased our suspicions. While she was in the two weeks of the exclusion method, Fatumata deteriorated and ended up in our critical department needing oxygen. A pulmonary X-ray (which we can only do on Sundays, when an X-ray technician from the capital works extra here) indicated tuberculosis, with severe pneumonia on both sides. We had no time to lose and started anti-tuberculosis treatment with four antibiotics. After a few days her fever was gone and her breathing was calmer. After three days, Fatumata sat up and drank her special formula and on the fifth day she ate two whole sachets of Plumpy'Nut. Plumpy'Nut is a nutrient-rich peanut paste used to treat malnutrition. In the two following weeks, she gained 1.5 kilos (a little over three pounds) and when I discharged her from the malnutrition department we played hide and seek between the chairs. After discharge from the malnutrition department, tuberculosis patients then go to the tuberculosis department, which is run by the Bissau-Guinean Ministry of Health. They stay there for a few days before they can go home, but come back for appointments to receive medicine. Treatments for tuberculosis are six months long, but mostly if you finish the treatment you’ll be cured. One week later I walked past the tuberculosis department on another matter and stopped to ask how Fatumata was doing. She wasn’t there, it turned out. When they looked in their registry, it showed that the grandmother took her home without any medication and without any planned follow-up. My jaw dropped for a moment. I realised that whatever you do, in the long run there are so many factors outside of your control. I don´t know what information the grandmother got at the tuberculosis department, but we had explained to her, in Fula, her own language, the importance of taking medication for several months and returning for check-ups. But how she took in the information and how we assured ourselves that she had understood was probably where it failed. That education is more important to public health than hospitals was something that I’d learnt before. At that moment it was clearer than ever.